Archbishop Peter Smith has been appointed as Archbishop of Southwark. You can see some basic information at his entry on Catholic Hierarchy website. Archbishop Smith was ordained a priest for the Southwark Archdiocese in 1972 and served as Rector of St John's Seminary, Wonersh. 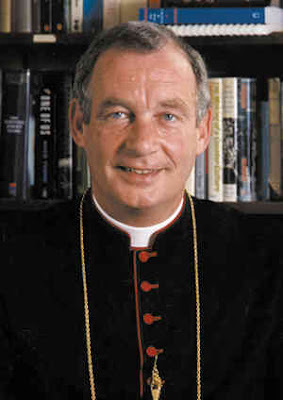 He was appointed as Bishop of East Anglia in 1995 and Archbishop of Cardiff in 2001. I prepared this post last night after receiving the Ad Clerum by email. Fr Philip Glandfield, the Archbishop's Secretary for Archbishop McDonald, introduced this on an "opt in" basis and I must say that I found it a very welcome development. The news was embargoed until 11am today so the post was scheduled to go up then. His Grace Mgr Peter Smith was born in London, in the Archdiocese of Southwark on 20 October 1943. He studied at the secondary school of Clapham College or the Xaverian Brothers. Having obtained a degree in civil law he entered the interdiocesan seminary of Wonersh where he followed courses in philosophy and theology. Following this, he was sent to Rome and obtained a doctorate in Canon Law at the Pontifical University of St Thomas Aquinas. He was ordained on 15 July 1972 for the Archdiocese of Southwark. Returning to his own country he was Professor of Canon Law at the major seminary of Wonersh, working at the same time as Officialis of the matrimonial tribunal of the Archdiocese of Southwark. In 1984 he became Parish Priest of St Andrew's in Thornton Heath, London. In 1985, he was appointed Rector of the interdiocesan seminary of Wonersh. Elected Bishop of East Anglia on 21 March 1985, he was consecrated on 27 March. On 26 October 2001 he was promoted as Metropolitan Archbishop of Cardiff. Currently he is Vice President of the Episcopal conference of England and Wales and President of the Department of Christian Responsibility and Citizenship within the same Conference. However, my sadness at leaving is tempered by the prospect of returning to my roots in South London and going home to the Archdiocese in which I was born and for which I was ordained a priest in 1972. I am very much looking forward to that and to serving the people, religious, deacons and priests of the Archdiocese of Southwark as their Bishop. It is good to be returning home, although I feel there is part of me which will always have a “second home” in Wales. There is also an announcement at the website of the Catholic Bishops' Conference of England and Wales. Archbishop Smith will be installed as Archbishop on Thursday 10 June.